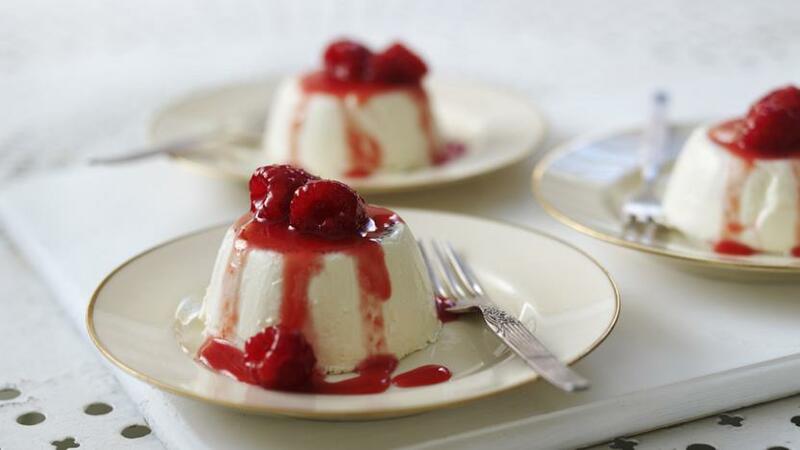 Try this easy recipe for creamy panna cotta served with a simple raspberry sauce. Place the milk, cream, vanilla pod and seeds and sugar into a pan and bring to a simmer. Remove the vanilla pod and discard. Squeeze the water out of the gelatine leaves, then add to the pan and take off the heat. Stir until the gelatine has dissolved. For the sauce, place the sugar, water and cherry liqueur into a pan and bring to the boil. Reduce the heat and simmer until the sugar has dissolved. Take the pan off the heat and add half the raspberries. Using a hand blender, blend the sauce until smooth.